In fall 2018, we updated our faith-at-church program by moving from monthly gatherings featuring several activities to weekly gatherings focused on one or two activities. This helps us reach more people, and gives us the flexibility to engage with more topics. Our mandate to equip our families for faith formation at church and at home remains the same. We'll post new activities and resources as they become available, and our previous activities are listed below. We are doing LEGOs in Lent this year! Most of the Scriptures for Year C matched up pretty well with suggested LEGO builds featured in the book, Building Faith Brick by Brick by Emily Slichter Given. Feb 17 / Beatitude Prayer Cards—this references two sets of cards. I cut and pasted them by hand to make one set of cards front and back. Feb 24 / Today we remember St. Matthias, who was chosen by casting lots, so we are playing a bingo prayer game inspired by Flame Children’s Ministries. For December, we used our LIFE 2.1 time for Christmas Pageant rehearsal. See our previous years for some great Advent ideas. Oct 21 / Farewell to our Director of Music—we colored and signed a prayer poster! This is our final LIFE 2.0 of the season, and it's a big one! We're excited to celebrate the arrival of the Holy Spirit with Pentecost today--we're wearing red and ready to be called out into the world. We're also wrapping up 10 days of Thy Kingdom Come, an amazing global prayer movement started by the Archbishop of Canterbury a few years ago. We've already seen the Spirit at work this week in our lives, and we'll definitely be participating again next year! For this session, we are scattering prayer stations, interactive and designed for all ages, throughout the church itself rather than our usual tables in the Parish Hall. We are using flame footprints to guide the way! In the church, we offer Praying the Lord's Prayer stations, similar to a Stations of the Cross activity. These devotionals come from Thy Kingdom Come's excellent, downloadable, and free prayer resources--we turned them into 7 prayer stations, laminated, and posted them around the church. From the same resources, we created a Praying for the World prayer station. Using a laminated world map, we are identifying places we're praying for using push pins and paper tags. Each participant gets a take-home card with a Bible verse. We are also praying for five friends, again from Thy Kingdom Come. We made a small worksheet with names on one side, prayers on the other, as a take-home. Participants use strips of leather or red-para cord to tie knots or use beads for each of five friends. Used as a bracelet or keychain, these will remind us to continue to pray for these five friends. Finally, our prayer leaders are offering prayers over people at the altar. It's an amazing Pentecost celebration! This is partially a repeat of our session from May 2017, with a few additions. We have decided to repeat this topic annually, since it teaches about such an important sacrament of our worship and feature of our Christian community. We asked members of the Altar Guild to return for a show-and-tell--this station had a lot of impact on some of our lower elementary students last year. We had a fully dressed chalice and host, and children were allowed to unwrap it to learn about the many parts. To them it was truly unwrapping a gift from God! This year, we also added an activity about designing banners and frontal pieces using symbols of communion, to tie in with the Altar Guild. The coloring pages and play-doh mats from Flame Ministries are always a popular station, especially for our younger, non-reading participants. We also kept the puzzles, matching game, and word puzzles to really emphasize the symbols. Instruction Sheet for Communion Banners and Altar Frontals--I just put out sheets of letter-size paper with a banner outline and legal-size paper for the frontals. 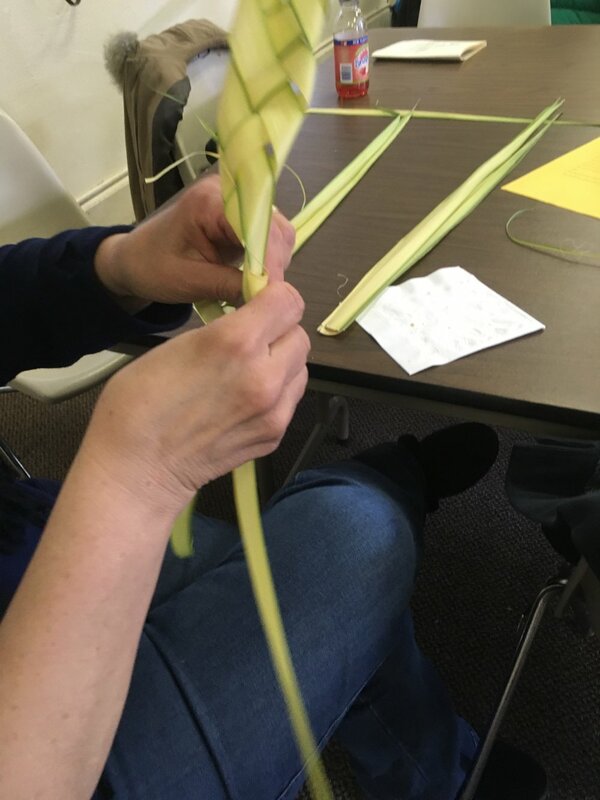 We gathered on Palm Sunday to start the journey from Christ's entrance into Jerusalem through his last dinner with his disciples, his ultimate sacrifice on the cross on Good Friday, and his triumphant resurrection on Easter. It's an emotional but deeply important story for us as Christians, and we offered several age-appropriate activities and resources to help families take this journey together, at home or at church. We look to the people from the Old Testament as models of faith in God. The stories of Genesis show us how much God loves each of us, from the Creation of the world to the saving of God's people (and animals) on Noah's ark. We also learn about an important family tree, going from Noah to Abraham and Isaac and all the way to Jacob. As all of these people walk with God, through good times and bad times, they make many mistakes but God loves them no matter what! 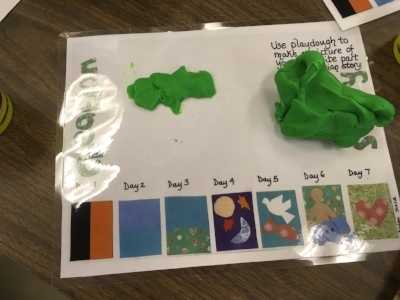 In our session, we had our usual coloring sheets and a play-doh mat marking the days of creation. 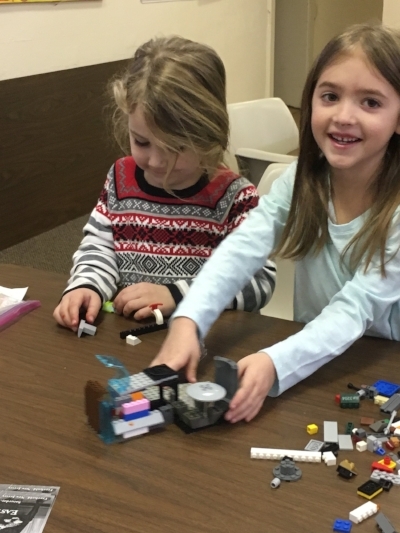 We also had some fun with LEGOs, building scenes from the Creation story and several creative versions of Noah's ark (and also Noah's motorbike and Noah's hovercraft, but that's ok because we're engaging with the story!). Finally, we worked on a family tree activity that connects our story with God's story in Genesis. As we celebrate the Baptism of Jesus at this time of year, and two baptisms of our own here at St. Peter's, we want to reflect on our own lives in Christ as we look at the symbols of baptism and our own baptismal vows. Activities this month include the usual coloring sheets with images of Jesus emerging from the River Jordan after his own baptism, and some great activities for younger children from Flame Children's Ministries. We also have a few reflective worksheets which work well for adults, or parents who can guide children through the activities. We will offer a show-and-tell with the liturgical items used in a baptismal service. And, finally, since we have just entered the season of Epiphany, we will offer an Epiphany star activity from Building Faith that gives us each a guiding star to walk with Christ this year! Advent is a holy season for Christians, marking the start of the Christian year with a season of preparation and expectation for the arrival of Jesus in Bethlehem and in our lives. Our LIFE 2.0 activities took a more prayerful turn this month in anticipation of this season. We turn to inward as we prepare not just our houses but ourselves for the gift of our Savior! Activities this month include a return to our (non) magnetic poetry, which gives us words to put into prayer. This is both freeing and frustrating as it limits us to the words on the table! Creativity abounds, though. Another activity is using a finger labyrinth to help focus our prayers and center us during this potentially hectic season. We also used a series of Coloring Pages from Illustrated Children's Ministries Advent Devotional series. Finally, we reflected on our upcoming Social Justice Bible Challenge, which begins today. This LIFE 2.0 session celebrates the great cloud of witnesses who are saints in the church of God. Using the hymn "For all the saints" by Lesbia Scott, we embrace the definition of a saint as a holy person, and, God's people, we can all be holy! All believers in Christ can be saints of God. We encourage participants in this session to think about what being a saint means to them, the characteristics of saints, and how they can be saint-like even in every day life. We talk about saints as people who "let God's light shine through." Activities for this session include several coloring sheets of different saints, plus a worksheet to identify saintliness in everyday life. We added names to a big cloud of witnesses, those who have influenced and shaped our own Christian journeys. We also have a silly saints mad lib game, courtesy of Forward Movement's Meet the Saints curriculum. Finally, since November is stewardship month, we included a family stewardship worksheet to help make our younger saints aware that stewardship of the church is important too! 2017 marks the 500th Anniversary of the Protestant Reformation. We are a Reformation people, so of course we are marking this anniversary with a celebration of these reforms and the diversity of belief that these changes brought! In this session, we are learning about Martin Luther and his reforms: translating the Bible into a language everyday people understand, the Five Solas of faith, and, of course, the 95 Theses. We are also celebrating our own Reformation heritage: as Episcopalians, we are part of the Anglican Communion which resulted from the Anglican Reformation in England shortly after Luther's reforms in Germany. This month, celebrate the Reformation with us! Our 2017-2018 kick-off program introduces Faith at Home. We all know about Faith at Church, but children who come from faithful homes are much more likely to become faithful adults! Although this can seem intimidating at first, faith at home is really often taking activities and conversations we're already having and putting them in a more faithful context. In this session, we introduce the Rev. Dr. David Anderson's Four Keys of Faith, which are Caring Conversations; Rituals & Traditions; Worship & Devotions; and Serving Others. Check out our resources to see how you can bring faith home! For our final session of the program year, we gathered to learn about what makes Holy Communion such an important part of our worship service. We learned how Jesus models sharing food and fellowship with his friends and disciples, not just at the Last Supper but also in many Bible stories such as the Feeding of the Multitudes, the Wedding at Cana, and in Old Testament stories like God sending manna to the Israelites. In addition, we learned about the different symbols of Communion, like grapes, wheat, a cup, bread and wine. The Altar Guild also gave a special show-and-tell about the things we use to "set God's table," and we talked about how eating at God's table is sometimes like eating at our own tables at home! We gathered in early April to learn about the traditional Ukrainian art of pysanky, which are elaborately decorated Easter eggs! 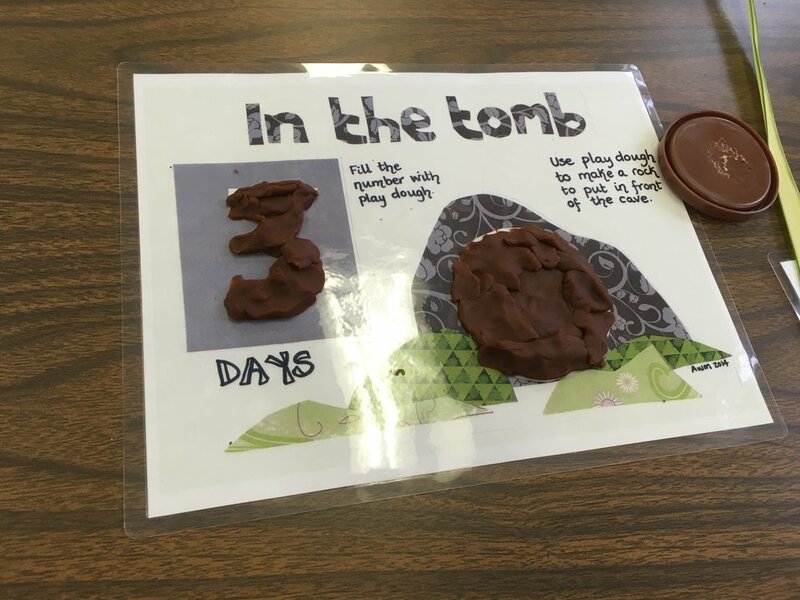 While adults and older children learned to apply multiple layers of wax and dye to create these beautiful eggs, our younger children decorated eggs of their own and worked on coloring sheets. 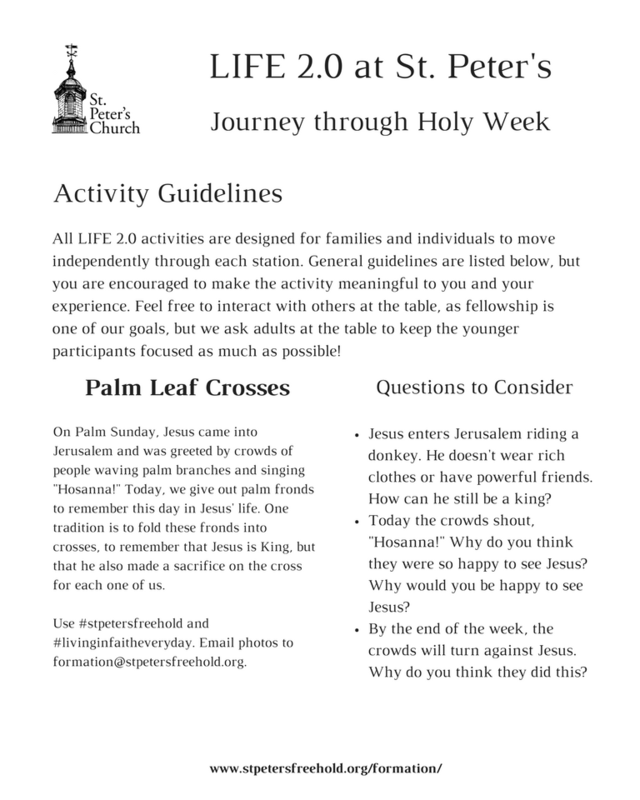 We also offered several Holy Week resources for families. On the first Sunday of Lent, we are embarking on an exciting Lenten adventure. Just like so many others in the Bible (the Israelites, Noah, Joseph and Mary, the Wise Men, just to name a few), we are journeying to be closer to God. Our projects for this adventure center around planning for such a long and important trip. We receive passports, to get stamps and stickers to mark the important milestones of Lent. We find and create different maps, including our Lenten Calendar, that help guide us on our long journey. We plan our adventure using a Lenten Journey Planner, which helps us identify appropriate praying, fasting, and giving ideas to help us in our Lenten devotions. Finally, in partnership with our Capital Campaign Prayer Team, we make banners to take with us on our adventure. Because of the importance of this journey, we have created an entire webpage devoted to resources to help you as you join us on this Lenten adventure! We're learning how and why God calls us to do his work here on earth by serving others. We know Jesus commands us to serve our neighbors, and we recognize who our neighbors are--some are right here in Freehold and some are around the world. Our projects today focus on some of our local issues, such as hunger and homelessness. We have coloring sheets that help us identify healthy meals, and encourage us to contribute to Open Door to help hungry people in our community. 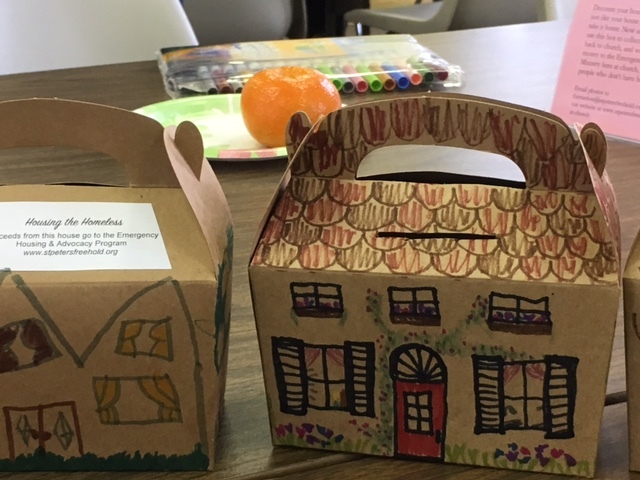 We decorate little houses which will collect coins and money for our Emergency Housing & Advocacy Initiative, the homeless men's program which St. Peter's helps to host. We also look to help globally by using our St. Nicholas coins from Advent to purchase several Gifts for Life from Episcopal Relief and Development. Finally, we work on a Secret Service Challenge, calling us to perform acts of service for a whole week (or longer)! Take Home Sheet: information about why we are called as Christians to serve others, and what the Bible has to say about that. This also includes a faith-at-home activity to encourage family service, a list of service opportunities here at St. Peter's, and a grocery store scavenger hunt to help collect donations for Open Door! An Activity Sheet for St. Nicholas Coins--even though we already purchased our Gifts for Life, this is a good exercise in stewardship and generosity! An Activity Sheet for a Secret Service Challenge. Using the Challenge Sheet and Idea Page, kids can come up with their own list of service projects. "Educating for Compassion and Justice," posted by Living the Good News, focuses on teaching young people about these two virtues using an "aware, care, share" model. Check out the Vibrant Faith at Home resource page for Serving Others--it's very comprehensive! It has activities and ideas for ALL ages and families. Give one a try! We learned about different types of prayer in this session! We prayed for cars (people in transit); buildings (and the people who live, work and go to school in them); and people as we moved around a playmat that represented our own communities. We used (non) magnetic prayer words to create our own prayers, too. We used a cross made out of LEGOs to fill in our own prayers--each prayer type had its own color: red for "I'm sorry" (penitence); yellow for praise; green for "please help" prayers for ourselves or others (petition/intercession); and blue for "thank you!" (thanksgiving). We focused on intercessory prayers (prayers for the needs of others): as we cut beautiful snowflakes we prayed for the many people for whom winter can be a difficult time. This intercessory prayer focus will help us prepare for next month's activities, focusing on serving others in need! Finally, because we have just entered the season of Epiphany, we choose and decorated a guiding star, each with a word on it that will hopefully bring us closer to Jesus in the new year, just as the star brought the Wise Men to him years ago! Take Home Sheet: information about the different types of prayer, how to do the Five-Fingers Funday School Prayers of the People, and some mealtime prayers for you to try at home! An Activity Sheet for the Community Prayers activity, which you could recreate at home using your own toys--cars, people, blocks! An Activity Sheet for a Winter Prayer List using paper snowflakes--a great way to encourage intercessory prayer in your family! An Activity Sheet for using LEGOs to try out different types of prayers. We're "preparing the way" for the birth of Jesus at our annual Advent Workshop! We made Advent Chains and looked at our St. Peter's Advent Calendar. We also created ornaments for a Jesse Tree, a tradition that comes from the imagery found in Isaiah 11:1: "a shoot will come from the stump of Jesse; from his roots a branch will bear fruit." Our Jesse Tree with be in the narthex throughout the season! We also tried something new: a collaborative Minecraft experiment! We joined in to build some scenes from the nativity story: a manger, the shepherds, the three kings, and even St. Nicholas! Take Home Sheet: information about St. Nicholas, building an Advent Wreath for your home, and suggestions for using your Advent Calendar at home! We used these Jesse Tree ornaments from Flame Creative Ministries, but you could get a little fancier, too--there are plenty of ideas on Pinterest! Here are some Bible verses that go with our Jesse Tree stories. An Activity Sheet for our Minecraft activity--try it at home! In this session, we were inspired by the work of St. Luke the physician to study the healing stories of Jesus. We made "get well" and "thinking of you" cards to send to those in need. We also focused on the healing power of prayer by making a healing cross. 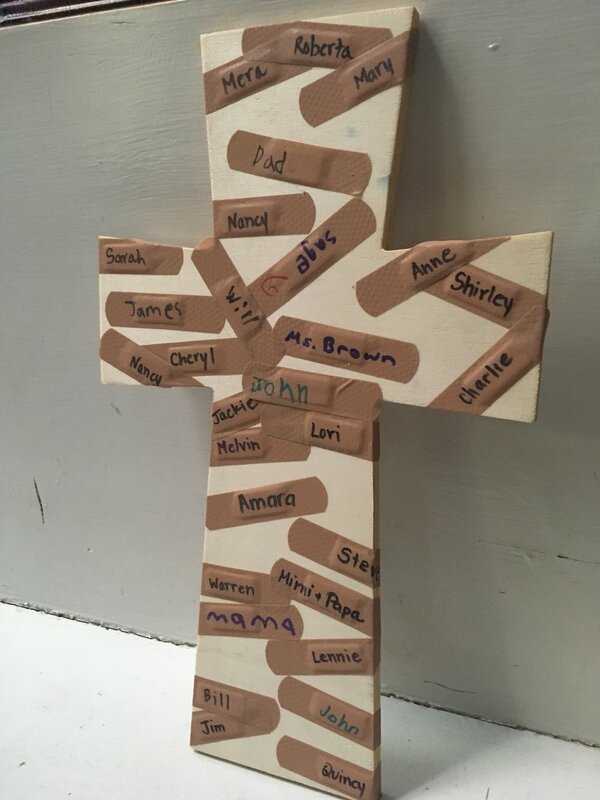 Participants were invited to write names of those in need on bandages, which were then attached to a wooden cross to signify the healing power of Jesus. 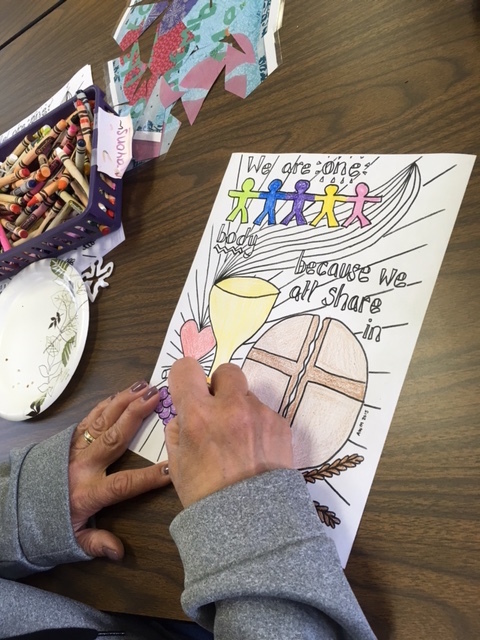 Our younger participants were invited to color in pictures of the healing stories from the New Testament, and to use play-dough to fill in a "Jesus Heals" page. Finally, we used LEGOs to illustrate some of the stories of Jesus and healing--this turned out to be a popular activity that will return to future LIFE 2.0 sessions--stay tuned! 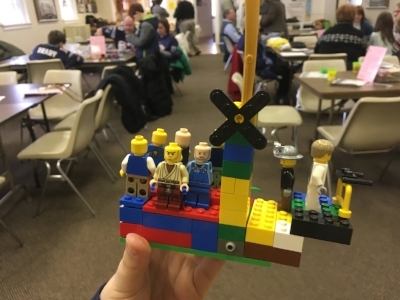 And check out this article from the Virginia Theological Seminary on using LEGOs at home and church to illustrate Bible stories. Take Home Sheet: verses, activities, and prayers to do at home! An Activity Sheet for the Get Well Cards, containing instructions and discussion questions. 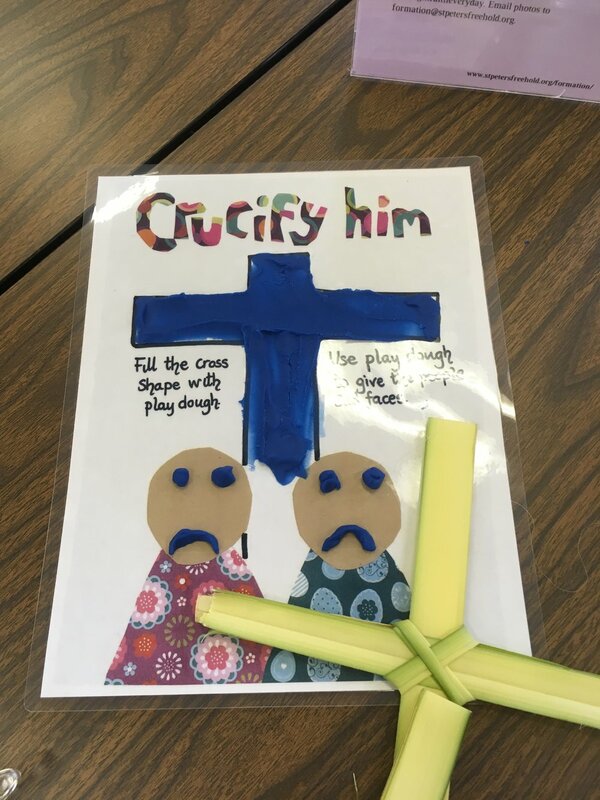 An Activity Sheet for the Healing Cross, which you could recreate at home using a cardboard or paper cross. An Activity Sheet for using LEGOs to portray Jesus in his healing ministry, using these Bible verses. Prayers from the BCP and Bible verses pertaining to healing.